Stories of my Wedding Officiating Adventures! It amazes me how people find me from all over the USA. I have married couples who planned "destination weddings" to Kansas City from Alabama, Arizona, California, Iowa, Nebraska, Colorado, and now...Wisconsin. Probably other states, too...those are just the ones I can think of. I'm very happy for all those who find LOVE and call me to help them make it meaningful, memorable, unique, and fun! Check out my Google+ Page. Follow me and add me to your circle! Antioch Park is one of my favorite places to do elopements. There is the Helen Cuddy Memorial Rose Garden, lots of bridges, stepping stones over a large pond, and this park is small enough that people won't have a tough time finding you! Elope today! Call Amy, the Minister of Love!!! 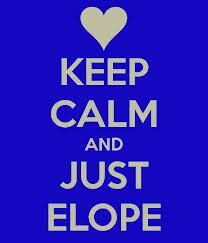 Keep Calm and Elope in Kansas City! Is the thought of a big, expensive wedding getting you down? Do you want to just elope and have an intimate wedding at your home, a park, or other location of your choice? Then...Keep Calm and call the Minister of Love today!!! I have lots of location ideas and ways to make your elopement a day to remember!! !